Roll out each of the split biscuits into rounds about double their original size (this is easy if you do it on another silicone baking mat and top the biscuit with a piece of parchment paper so it doesn’t stick to the rolling pin). Spread the “jam” over the rolled out biscuits and sprinkle with the chocolate chips (reserve one tablespoon of the chocolate chips for topping). Spray a 9×5″ loaf pan with cooking spray and lean it at a steep angle so you can easily layer the circles of dough. 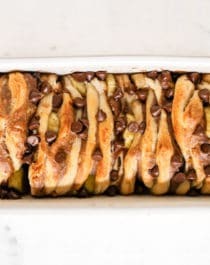 Stack the circles of dough in the loaf pan, adding a sliced banana in between the layers, alternating the spot you put the banana so each piece is different. Once the pan is filled, sprinkle the remaining chocolate chips on top.